The Crazy Mountain Brewery Hot Summer Nights concert series welcomes Sister Sparrow & The Dirty Birds to the stage of the Gerald R. Ford Amphitheater in Vail on Tuesday, July 19. 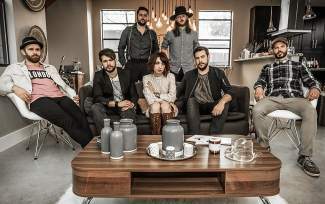 • July 19 — Sister Sparrow & The Dirty Birds: Brooklyn, New York-based seven-piece soul-rock band led by big-voiced Arleigh Kincheloe. • July 26 — 8150 Urban Dance Challenge: Colorado’s best hip-hop crews and B-boys compete for prize money and a chance to perform during the Vail International Dance Festival’s Dance TV. • Aug. 16 — Devon Allman Band: Combination of Southern blues and rock; must-see for any fan of The Allman Brothers. • Aug. 23 — The Motet: World-class Colorado improvisational funk band, with a reputation for throwing infectious dance parties. Doors open at 5:30 p.m.; show starts at 6:30 p.m. All shows take place at Gerald R. Ford Amphitheater in Vail. Visit www.vvf.org to learn more. VAIL — Sister Sparrow & The Dirty Birds frontwoman and Catskills, New York, native Arleigh Kincheloe returns to her mountain roots with the rest of the band tonight at the Gerald R. Ford Amphitheater in Vail as part of Crazy Mountain Brewery’s Hot Summer Nights concert series. This seven-person band has brought big horns, gritty blues and soulful vocals to more than 700 shows since 2011, playing on the “Today” show and releasing three full-length albums, plus a live album, “Fowl Play.” The Dirty Birds have performed with bands including Trombone Shorty, The Avett Brothers, Counting Crows and Galactic. Crowds will see live dance moves in addition to music at the next Hot Summer Nights event, the 8150 Urban Dance Challenge (July 26), before the Vail International Dance Festival comes to Ford Amphitheater, July 30-Aug. 13. Hot Summer Nights continues after the festival, when the Devon Allman Band (Aug. 16) and The Motet (Aug. 23) play the final two concerts of the 2016 summer series. Along with live tunes, there’s another reason to attend the Hot Summer Nights concert series: the chance to score free beer for an entire year. Crazy Mountain Brewing Co., which returns as the title sponsor of the event, will award one person a free pint of beer a day for an entire year, redeemable at either the Edwards taproom or the new Denver location at 471 Kalamath St. Enter the raffle at each concert (one entry per person per concert) by adding your name and a valid email address. A winner will be picked during the final show, The Motet, set for Aug. 23. The Gerald R. Ford Amphitheater is located east of Golden Peak at Ford Park in Vail. Concert attendees are asked to park at the Vail Village parking structure, with overflow parking at the Lionshead Village parking structure. Free town of Vail shuttles will run extended routes past Golden Peak from 5:30 to 9:30 p.m., with a drop-off at the soccer field near the Ford Amphitheater. Additionally, a special Village-to-Village express bus will run from 4 to 9:30 p.m., with stops at the east entrance of the Lionshead Village parking structure, in front of the Vail Village Information Center and at Ford Park. Once inside the concert venue, picnics with commercially sealed nonalcoholic beverages are permitted, as are legless lawn chairs, blankets and umbrellas. Bikes, skateboards and dogs are prohibited at the amphitheater. For more information, visit http://www.vvf.org or follow Vail Free Concerts on Facebook.